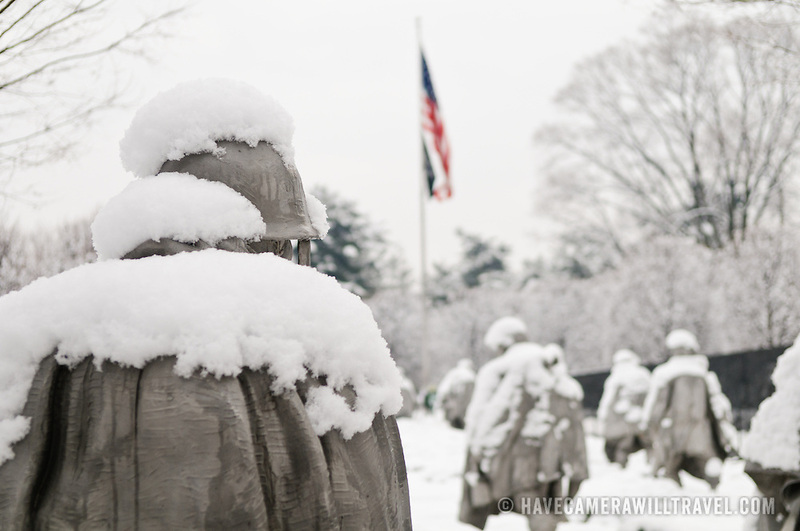 The Korean War Memorial on the National Mall on a snowy winter morning, with the American flag in the distance. The Korean War Veterans Memorial, unveiled in 1992, sits on the northwestern end of the National Mall, not far from the Lincoln Memorial. It consists of several elements designed by different people and groups. It has a triangular footprint with the main elements being “The Column” consisting of 19 stainless steel solders, each over 7 feet tall, and a reflective granite wall etched with the faces of thousands of Americans who lost their lives in the war. At one end of the triangle, behind the soldiers, is a grove of trees. At the other is a large American flag and a small Pool of Remembrance. Among the designers were Frank Gaylord (the soldiers) and Louis Nelson (the reflecting granite wall).